Finding conventionally grown produce in organic sections has happened to me so many times. I am usually in a hurry, I run into the shop, head straight for the organic section and pick up the first nice looking tomato that I see. Then I quickly glance at the PLU code and I find that the tomato is actually not organic. Smaller shops I find to be the worst culprits. It also pays to be careful in Whole Foods as their fruit and veg can be both organic and conventionally grown. Our local Whole Foods is pretty good at labelling these where possible but sometimes the labels get mixed up or moved slightly and it is difficult to work out what is organic. 4 digit code – This code applies to all “non-qualified” produce. It means that the produce was grown in a conventional way which included the use of pesticides. The number itself should have a prefix of 0 but this is usually omitted giving only a 4 digit PLU code. The four digit number is a code for a particular fruit or veg. For example banana has a code of 4011. 5 digit code which begins with 9 – This code applies to all organically grown produce. 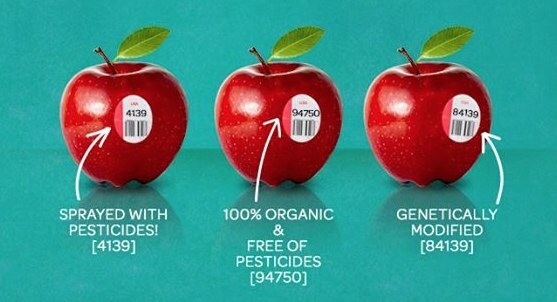 In addition, it also applies to all non GMO produce because the use of genetic engineering or genetically modified organisms (GMOs) are prohibited in organic products. So for example organic banana would have a code of 94011. 5 digit code which begins with 8 – This code applies to all genetically modified produce. For example genetically modified banana would have a code of 84011. This PLU code system has been in place since 1990s but it’s downside is that it is not mandatory. This means that the producers can choose whether they label their products or not. In general, if the produce is organic then the farmers want everyone to know that and they include the PLU code on their fruit and veg. However if the produce is genetically modified, the farmers can choose not to label their products with PLU code. To make matters more confusing, if the farmers expect the price of the GMO produce to be the same as the conventionally grown produce then they can label the product simply with 4 digits. Given that the PLU codes are not mandatory and there is an incentive for farmers to manipulate the type of code they use, the only reliable code is the one that contains a number 9 prefix. If you really want to buy non-GMO produce then buy organic or you can check out the non-GMO shopping guide. So next time you are in a shop check what you are really buying. You may find in your shopping basket something that you did not expect. Tags: Genetic engineering, Genetically modified organism, Genetics, GMO, PLU, PLU codes, Price look-up code, Produce, Whole Foods | Permalink.